As skilled nursing facilities scramble to prepare for Payroll-Based Journal (PBJ) reporting requirements, many are encountering more questions than answers. Use these resources to ensure that your organization has a plan for successful compliance. For SimpleLTC customers, SimpleConnect™ will help you easily manage your PBJ file submission, tracking and reporting needs. (Click here to request info). Learn how CMS will use your PBJ data in its calculations, and how the new PBJ requirements may affect your quality ratings. We’ll also cover why your MDS assessments are more important than ever, plus common PBJ issues being raised in PBJ audits. Learn the top mistakes to avoid in planning for PBJ reporting and compliance, as well as how to create a successful end-to-end PBJ process at your organization. Want to simplify PBJ file submission to CMS? 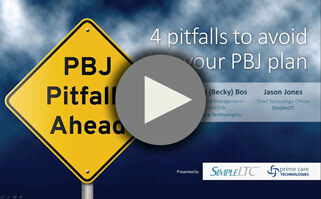 With SimpleLTC, one thing you won’t need to stress about is submitting your PBJ .XML files to CMS. SimpleConnect™ provides a simple, affordable way to manage all your PBJ file submission, tracking and CMS reporting needs. CMS has released Excel templates that allow you to convert your PBJ data into a valid XML format for submission. The templates work with Excel 2010 and later, and are available on the CMS Staffing Data Submission PBJ page. Instructions are included on the first tab of each spreadsheet. The user is responsible for getting their own data into the Excel format in the template provided and ensuring the data meets the rules of the PBJ Data Specifications (available on that same page).